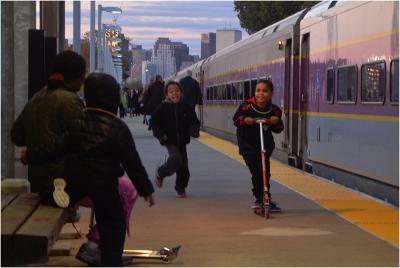 A bill filed by Dorchester lawmaker Evandro Carvalho last month that would direct the MBTA to launch a two-year “pilot service evaluation” of the Fairmount Line is a promising development. If adopted, Carvalho’s bill could finally put the Fairmount on a new track — one long envisioned by transit equity advocates who want the commuter rail line converted to a rapid transit corridor more consistent with the service levels, convenience, and price-points of the Red and Orange lines. Carvalho’s proposal  would re-brand the Fairmount as the “Indigo Line,” a term long favored by activists in Dorchester and Mattapan who have spent decades now making the case that the communities of color were disproportionately ill-served by the rail corridor. The Indigo Line is a concept whose time has finally come. We hope that our delegates at the State House will join with Rep. Carvalho in moving this legislation ahead expeditiously. Right now, like many new bills in the just-seated legislative session, Carvalho’s measure has not been assigned to a committee. When it is given an assignment, local lawmakers should ensure that it gets heard in a timely manner, revamped as needed, and moved ahead as a priority transportation initiative in the city of Boston. Carvalho’s bill in its current form would go far beyond a marketing makeover. It would direct the MBTA and Keolis, which operates the line, to run trains every 15 minutes during peak times and no longer than every 30 minutes off-peak. That’s far less frequently than the Red Line trains run, but still a major shift for a line that today runs trains every 40 minutes in peak times. The “pilot” nature of the program would allow the T to “assess the impact of adequate service levels” using revised ridership data within 180 days of the bill’s adoption— if it becomes law. Another key provision of the bill: Users would be able to utilize Charlie Cards instead of buying tickets on the trains. Proponents of the bill hope that the more robust schedule and easier access will boost ridership on the Fairmount Line, which MBTA figures suggest have been lower than hoped-for given the investment in new stations — including three in Dorchester— with a fourth stop on Blue Hill Avenue now on track to open in 2019. Now is the time for lawmakers, state transportation officials, and Keolis managers to hammer out the specifics of the Fairmount’s future. Carvalho’s bill offers a sensible framework as a starting point for that discussion, which we hope will result — at long last— in the birth of the Indigo Line.